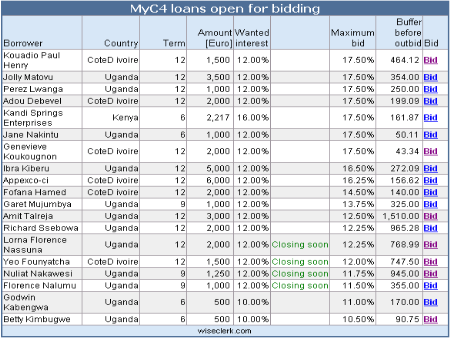 You mention in “loan open for bidding” that new bid always must be placed at least 0.5% lower then the current high bid. But as far I know (and have done) 0.25 is enough. thanks for mentioning that. I tried it today and you are right. It seems to have changed since I wrote this article last year. Do you think it is possible from your data to keep an eye on bidding time statistics- How many days will a 100% funded loan stay on your page showing that it is 100% funded at with an interest as or lower than wanted. I am not tracking that, but my (subjective) impression is that fully funded loans are usually closed by the provider within the next 48 hours.